Respiratory tract infection is the commonest infection in children. About 15% of respiratory tract infections in children are due to CROUP. 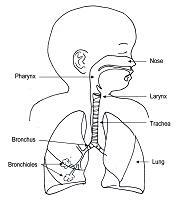 CROUP is also known as acute laryngotracheobronchitis. As the name suggests, it’s an infection that affects the upper airway specifically larynx, trachea and bronchus in children. (Figure 1, 2). Although the infection can occur in children between the age of six months and twelve years old, the commonest age group is in young children which peak at the age of two year old. The annual incidence is up to 6 cases/ 100 children of less than six years old. 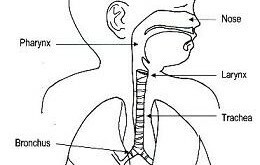 It is the commonest cause of acute airway obstruction in young children. Male to female ratio is 1.5 to 1.0. The illness usually preceded by 12 to 72 hours of low-grade fever and coryzal symptoms like cough and watery nose. This is followed by hoarseness of voice and “croupy” or barking cough. Other symptoms include difficulty in breathing, noisy breathing (stridor) and poor feeding. The barking cough and the noisy breathing are the prominent symptoms in Croup which is related to the narrowing of the airways secondary to the infection. In moderate to severe cases, it may lead to significant upper airway obstruction which caused marked difficulty in breathing and cyanosis (blue discoloration of lips and extremities). Viral croup symptoms usually resolved within one week duration. Croup is an infection caused by respiratory viruses like Parainfluenza, Influenza, Measles and RSV. Severe upper airway obstruction will lead to hypoxia (lack of oxygen in the blood) which may complicates other organs like brain, heart etc. 15 % of the children infected with croup develop complications e.g. middle ear infection (otitis media) or lung infection (pneumonia) and dehydration. Secondary bacterial infection is possible that may worsen the symptoms. Treatment is supportive i.e. to keep good hydration and prevent hypoxia. Medications like steroid and nebulized adrenaline are helpful to reduce the severity of the disease especially the upper airway obstruction. Antibiotic has no role in this illness. Moderate to severe cases require hospital admissions for treatment and monitoring. General measures like good hygiene and nutrition are essentials. Vaccination may reduce the risk of infection e.g. Influenza vaccination. Recognizing early signs and symptoms of deterioration is important to prevent hypoxia. Parents are advised to bring their children with symptoms suggestive of croup for early medical assessment and treatment.